There are well over a thousand casinos online. Most conduct their business ethically. Some end up with a bad reputation over just a few misunderstandings. Others are plain fraudulent. The best way to avoid fraudulent casinos is to stick with the ones we list throughout the Games and Casino website. Those online casino, online poker, and online bingo sites are carefully chosen by reputation and reports from other players. It is a lot easier to pick out the good ones than to prove the bad ones are crooked. So do yourself a favor and choose from the many honest and highly rated places listed by Games and Casino. 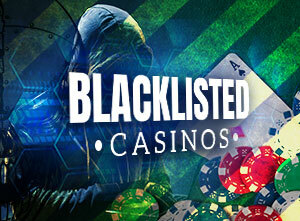 The following is a list of casinos that have been declared blacklisted or rogued by other online casino sites as well. Unfortunately, there is no concrete place where all the information that got these casinos blacklisted can be found. We present these for your convenience, so you do not have to surf all over the web to pull this information together. Be aware that all of this is hear-say and simply collected off the internet and not an official, court-compiled list. The evaluations are based on complaints by vocal players from various websites. Some are based on research into licensing and related legal issues. In the past and up until now players have experienced unsatisfactory customer support and slow and delayed payments of winnings. In July 2016 Latest Casino Bonuses also discovered that Pamper and its sister brands had unlicensed and fake Aristocrat, NetEnt, Novomatic, Playtech and Quickspin games. Read all about it here. Recently removed from the Blacklist after player complaints have been resolved. Shady business practices have been determined including hosting unlicensed Net Entertainment games. It also has unlicensed Novomatic games that have been reported to the Casino for removal. This group of casinos should strictly be avoided due to unethical business practice associated with affiliates and customers. Non-payment issues to partnerships as well as changing the Terms and Conditions of Casino rules has been an ongoing concern with Buffalo Partners Group. Affiliate Club is not blacklisted anymore! Gamesandcasino.com removes rogue status from online casino Casino Club and associated properties, as well as its marketing arm Affiliate Club. Affiliate Club, the marketing arm, had introduced a term to their contract that gave Affiliate Club the right to stop all payments of monies earned should the affiliate cease to promote the property. This new term would have crippled the ability of affiliates to respond to player complaints, since they would have lost everything they had earned. However, Affiliate Club has now removed this term and their T&Cs are fine. Games and Casino is herewith removing Affiliate Club, CasinoClub, Casino Club Poker, Poker Kings and Slots Club from the blacklist. Grand Prive Casinos are blacklisted! Do not play at Casino Grand Bay, Bella Vegas, Lake Palace, Roadhouse Reels, Jupiter Club, Fortune Junction, Jackpot Wheel and Villa Fortuna. Learn more on the GrandPrive Blacklisted page. The following casinos appear to be going through the process of arranging for pay outs, but the payments never arrive and communication breaks down. These casinos are spamdexing all the search engines. To be seen everywhere are the rogued Clubdice casino, the blacklisted Carnival casino and the rogued New York and USA casinos as well as the blacklisted CDpoker. They are spamming the search engines in exactly the same way people who sell Viagra spam your mail. This is totally, unethical, forbidden by the search engines and must be very annoying to people looking for real information. The rogued CasinoPays is even conducting competitons with prizes for Search Engine Spammers! Read more here: Casino Pays Rogue Casinos. Absolute Poker has had a couple of huge cheating scandals. They seem to have been run in a decent manner, and if it wasn't for the way they handled the cheating we would have continued to carry them. Extreme warning - This casino's owner has disappeared and there is no contact. Stay away! This is not a licenced casino and who knows what the software is. Since it is unlicenced and using unknown software, we recommend you stay away. Affiliates say they never make money anymore because BeAffiliates are not paying anyone but pennies. Since the sale, its a loss everytime anyone clicks on the affiliate-linked sites and a lot of money is lost. which they now have done for some affiliatesafter previous years having sent many players to Expekt, for example. This may also be true for their other properties, i.e. online poker, mobile, and others. These guys have a reputation for giving huge bonuses which make it almost impossible to fulfill the wagering requirements, so you can't withdraw. Should you get close to withdrawing, you get another bonus that will put you in the hole again. If you should be lucky enough to end up with winnings anyway, they have a reputation for just not paying the winnings. Stay away! This casino spams, employs search engine cheats (blackhat webmasters) and is rude as heck to players and people who complain about spam. We simply won't deal with such dodgy outfits and neither should you. This software has glitches - in favor of the casino. Don't play on rigged software! These guys seem to be changing the rules after the game - you can play your bonus just the way you were told to when you got it, but when you want to cash out they tell you the rules are different. And low and behold, they changed them while you played. Don't play at casinos that change the horse in the middle of the race! What? What kind of name is that? And the software looks shoddy and plays awful. And they copy pages from other casinos to theirs. This looks like bad software to me… Don't play shoddy software. These guys don't seem to want to pay for advertising they purchased. That's a bad omen. Don't play there, if they cheat others, they may well cheat you too. Another casino with weird software that is rigged. If it looks and plays weird, don't play there. These casinos have lots of non-payment complaints. Just say no! Nobody home if you want to get paid… It's a shame, too, but don't risk it. What software is this? Who knows? I don't. In any case, they don't pay players their winnngs. Stay away from the great unknown! The web is buzzing with reports of non payment to winners. This place has no licence and some really weird wagering requirements. They have to answer to no one, and they don't. They use the huge bonus trick - keep you knee deep in bonuses, making sure there are always wagering requiremnts to be fulfilled and you can't cash out. Think you can still win? It's remotely possible, but then - they don't pay! Weird, faulty software, and they don't seem to pay players. Run, run! They manipulate whether you win or not from the backend. They set it to make a certain profit and so you are doomed from the start. Spammers. We don't like spammers. These are very questionable, usually way underfunded and unable and unwilling to pay winnings. Used to be great and then got sold. Now they don't pay. They just collapsed. No one knows why, really, but it sounds like internal fighting. The result - no one is getting paid. There are some strange screenshots circulating, showing faulty software. I wouldn't play there. Gamesandcasino is pleased to announce that 888 Casino-on-Net appears to have rectified all the problems that landed them on the blacklist. We feel free to recommend the casino again. However, due to the current legal situation, 888 is not accepting any US players at this time. This also extends to the poker room Pacific Poker. Both the casino and poker room have been online for a very long time and are well run and well organized. The following Casinos are still blacklisted but are now under new ownership or management or are otherwise trying to redeem themselves. I am not removing them from the blacklist, and I cannot recommend them yet. If you play there, please proceed with caution. If you have any trouble, please let me know at domnique @ thegoodluckcharm.com. If you are happy, please let me know that too. These casinos are trying to prove that they are reliable and solid now, and they have shown me some evidence that they are on the right path. The Casinomeister rogued IGS casinos and I am following suit. IGS is a cheap software that is being sold freely to anyone who wants it. That is really bad news since there are lots of owners who do not have the resources to pay winners. Underfunded casinos are big trouble. They tend to have bad or nonexistant service. And they often go broke. If the software company were ready to step in and, in order to protect it's reputation, took care of such problems, that would still be acceptable. But that does not appear to be happening here. There are numerous player complaints that emerged over time, and they are not being taken care of. Which can be set to exclude generating certain hands of video poker In an independent study of this software one has come to the conclusion that the games offered by this company are not random in nature. Customer denied full winnings because the game results were "not random enough"; web site copied from other casino web sites testimonials for games they did not offer; games violate international copyrights; misrepresented as licensed in Antigua; software written in Russia. Unified Gaming Site that used unauthorized awards and membership seals AND Account details of over 50 players, including credit card details, posted on Russian site for at least three days because of security breach. CSR tells players not to bother canceling credit card, offers bonus on future deposits, assures players they will prosecute fraudulent charges. Not that they have any way of detecting such charges or prosecuting fraudulent use in Russia! Did not respond to inquiries from several webmasters and mediators after Arcada casino denied a winner of their Keno jackpot.